The acclaimed film "Nader and Simin, a Separation" by Iranian director-writer Asghar Farhadi is among five nominees for the best foreign film award at the British Independent Film Awards (BIFA). "Animal Kingdom" by director David Michod, "Drive" by Nicolas Winding Refn, "Pina" by Wim Wenders, and "The Skin I Live in" by Pedro Almodovar are the other nominees in the category. On October 20, Farhadi was named the Middle East Filmmaker of the Year by Variety, an American weekly entertainment-trade magazine which is one of the main sponsors of the BIFA. 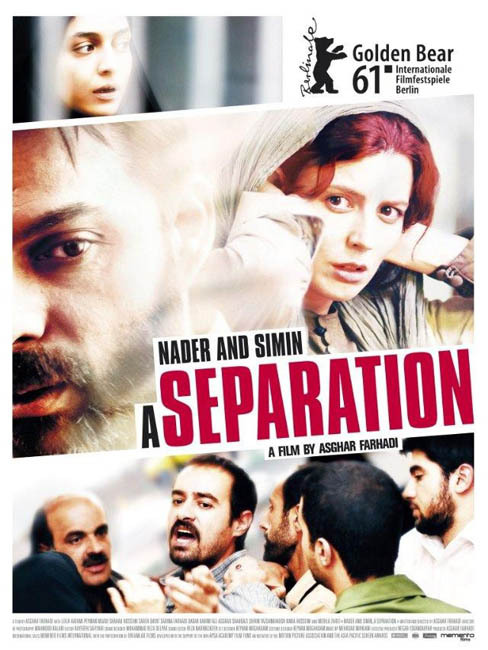 "Nader and Simin" is Iran's submission to the 84th Annual Academy Awards in the Best Foreign Language Films category in 2012. The film won a Golden Bear for the best film at the Berlin Film Festival and its cast ensemble received best actor and actress Silver Bears at the event this year. The BIFA Pre-Selection Committee of 70 members selected the nominations, which were decided by ballot. The BIFA jury includes Josh Appignanesi, Lucy Bevan Edith Bowman, Mike Goodridge, Ed Hogg, Neil Lamont, Mary McCartney, Molly Nyman, Debs Paterson, Tracey Seaward, Charles Steel, David Thewlis, Ruth Wilson and Justine Wright. The winners will be announced during a ceremony, which will take place on December 4 at the Old Billingsgate in London.